Francis in his lab in 2007. My passion for the field of research in embryonic craniofacial development and craniofacial malformations stems from my life experience with a congenital craniofacial disorder. I was born with Treacher Collins syndrome, in which the bones and tissues of my upper and lower jaws, my eye socket rims and cheekbones, and my palate failed to form normally. This led to a cleft palate, jaw deformities, obstructed airway, total lack of ears, and lack of cheekbones and lower eye socket rims. These defects required tracheotomy (to enable breathing), over 20 surgeries to correct the anatomical deformities, intensive one-on-one speech therapy for the cleft palate and oral anomalies, and specialized bone-conduction hearing aids to enable me to hear despite the lack of ears. Owing to my frequent surgeries, I developed an interest in anatomy and surgery early on in my childhood. 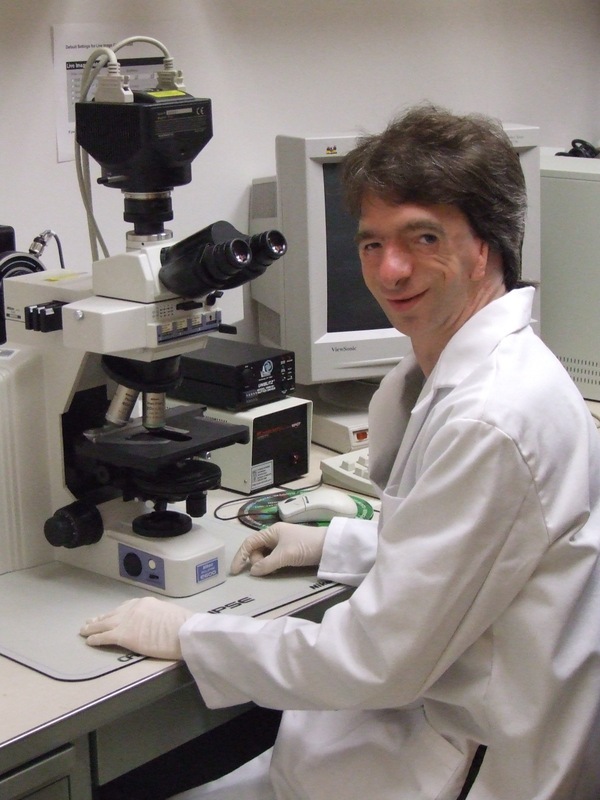 In high school, I first learned of the isolation of the Treacher Collins syndrome gene, TCOF1, by Dr. Michael Dixon and his group at the University of Manchester in England. That may have planted a seed early on for what became my career, as it stimulated my interest in genetics, and later on, craniofacial embryology. In high school, I realized I wanted to pursue a career in the medical field, particularly in the craniofacial field. Initially I wanted to practice craniofacial surgery, inspired by those surgeons and other specialists who had worked together to restore my face to normal in function and appearance (and even applied to medical schools). However there was still my hidden but growing interest in craniofacial research. Finally it was in London that my career focus changed, when I was at last given an opportunity to get involved in laboratory research in embryonic craniofacial development, encompassing genetics, molecular biology, and embryology. I was studying anatomy, biomedical science, and embryology at King’s College London (2004-2007) when I was presented with an opportunity to participate in laboratory research in craniofacial genetics in mouse embryos in the summer of 2006. So I pursued and won a Wellcome Trust UK grant and spent that summer tracking the expression pattern of a novel craniofacial gene in mouse embryos, which got me a co-authorship in a paper published the following year. I ended my course at King’s with a thesis project on chicken craniofacial genetics. My mentors there, seeing the quality of my research work, encouraged me to pursue a PhD in the field. I pursued my doctorate at the University of California-San Francisco (UCSF) from 2007-2012. My dissertation project was to examine the role of hypoxia during early embryonic development of chicks in causing craniofacial malformations. This was my first major NIH-funded project. I found that early embryonic hypoxia in ovo led to a metabolic stress response which caused massive cell death (apoptosis) in the critical stem cell population, cranial neural crest cells, that form the craniofacial bones and other tissues. This in turn leads to reduced cell numbers, causing underdevelopment of the craniofacial region. I achieved my PhD in 2012, and published this in a journal the following year. My first postdoctoral fellowship (2012-2015), in Calgary, Alberta, was also funded by the NIH, and focused on craniofacial 3-D imaging and morphometric (shape-measuring) analysis. My current postdoctoral fellowship, at the University of Colorado, is also funded by the NIH—with a diversity supplement designed for those scientists from underrepresented groups, including those with physical challenges (including myself). My current project focuses not only on basic science (this one dealing with analysis of the control of craniofacial gene expression in mouse embryos), but also on enhancing my skill and ability in public relations and outreach from the bench to the public and families with children affected by facial disfigurement, as a spokesman bridging science and the public. The NIH has been a valuable resource to me, by funding my research and helping me promote craniofacial research to the wider world.